Planning to travel outside the city, do not miss the latest collection of luggage at Matahari Department Store. A total of three well-known foreign brand luggage presented here, with special discount promotions. Just mention the French luggage brand, brand Delsei offered at 60-70 percent discounts. In addition, Cellini's Italian given 50 to 60 percent discount. And last brand origin country Lojel Japanese sakura in 30 per cent discount. Nofri say, a sales promotion boy Matahari Department Store Mega Mall, though only three months of entry in Batam but these brands already have a market share in other countries. "The product is new to the city of Batam, but already have a name in the world market share. And each brand has its own advantages. The course has been tailored to the needs of people today. Starting from the needs of the job, a family vacation, and other. So that prospective buyers can actually choose which one is most suitable for him, "said Nofri. For the brand Delsei, said if the suitcase is a French origin has an advantage that is more powerful. 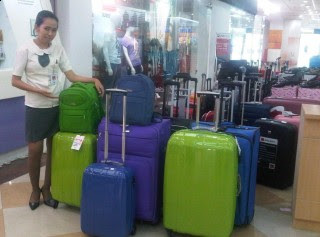 Delsei own choice luggage sizes ranging from 19 inch, 20 inch and 29 inch. As for Cellini brand, famous models, motives, and the material is varied. The size is almost the same brand suitcase with Delsei, only the largest size of Cellini to 31 inch. And for Lojel, called Nofri known as polycarbon suitcases made from the anti-break, to start 19-inch sizes available, 25 inch, 29 inch well. Price suitcases are too varied for each brand, the brand Delsei starting price of 1 million 900 thousand to 3.6 million rupiah. For the brand of Cellini, the price starts from 1.3 million to 2.9 million rupiah. And for Lojel, starting 1.4 million up to 2.5 million rupiah. Not until there, purchasing a suitcase with a 50 percent discount below could get two-year warranty.